David Hare is one of the UK’s most prolific and critically acclaimed writers, having written extensively for the stage, television and film. His plays include Plenty, Skylight and Stuff Happens. His film work includes The Hours and The Reader (for both of which he received Academy Award nominations for Best Adapted Screenplay), and the new film about ballet dancer Rudolf Nureyev, The White Crow (directed by Ralph Fiennes) which will be screened at this year's London Film Festival. David Hare was recently described by the Washington Post as ‘the premiere political dramatist writing in English’ and his new play, I’m Not Running, follows in his political drama style. Sian Brooke plays Pauline Gibson, a doctor and leader of a campaign to save her local hospital, who faces agonising decisions about her future in politics and a friendship that spans 20 years. An examination of private lives versus public personas, Peter Gynt, David Hare’s new version of Henrik Ibsen's Peer Gynt, plays in the Olivier Theatre from 27 June 2019 – below are some highlights from his illustrious National Theatre career. Anthony Hopkins, Tim McInnerny and Peter Blythe in Pravda by David Hare (1985). Photo by Nobby Clark. Claire Higgins and Oliver Ford Davies in The Absence of War by David Hare (1993). Photo by John Haynes. Diana Rigg and Lesley Sharp in David Hare's version of Bertolt Brecht's Mother Courage and her Children (1995). Photo by Ivan Kyncl. Judi Dench and Samantha Bond in Amy's View by David Hare (1997). Photo by John Haynes. Behind the Beautiful Forevers, based on the book by Katherine Boo, adapted by David Hare. Photo by Richard Hubert Smith. James McArdle and Nina Sosanya in Platonov, by Anton Chekhov, in a new version by David Hare (2016).Photo by Johan Persson. 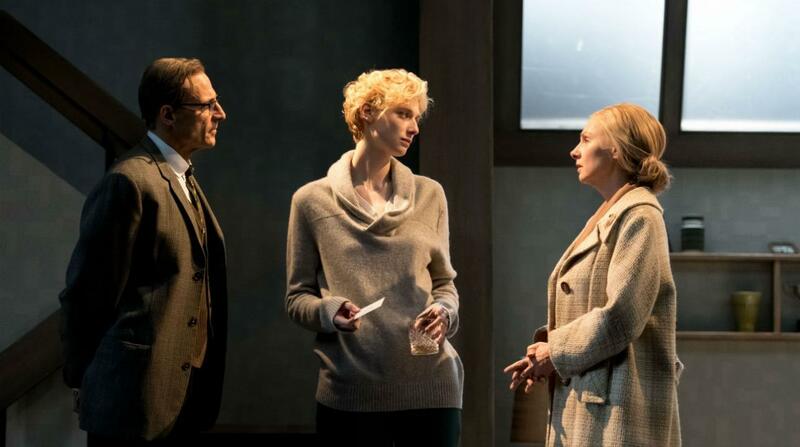 Elizabeth Debicki, Mark Strong and Hope Davis in The Red Barn, a new play by David Hare, based on the novel La Main, by Georges Simenon (2016). Photo by Manuel Harlan. You can see David Hare's new play, Peter Gynt, in the Olivier Theatre from 27 June 2019.